I am giving away tickets so you can experience it too! Be sure to enter! Ok now it’s time to enter the giveaway! Read below for the schedule and all about the special guests! Here’s all the info about the fair! Gates open for ticket holders at 10 a.m. Friday, Saturday & Sunday. 11:00 a.m.: Main Stage: Melissa Caughey of Tilly’s Nest, HGTV.com & CountryLiving.com writer and contributor, will share secrets to successfully run a beehive, followed by a book signing. Books will be available for purchase on-site. 1:00 p.m.: Main Stage: Joanne Palmisano, award-winning interior designer & regular DIY Network contributor will share secrets to using vintage and salvage for beautiful design and decor, followed by a signing of her book Salvage Secrets Design and Décor. Books will be available for purchase on-site. 1:00 p.m.: Kitchen Stage: Nancy Fuller, TV personality & author of Farmhouse Rules, will be doing a cooking demo on her “Butternut Because Soup” followed a signing of her cookbook Farmhouse Rules. Books are available in advance online at stellashows.com and will also be available for purchase on-site. 3:00 p.m.: Main Stage: Jana Platina Phipps, The Trim Queen, will share tricks to turn items in your wardrobe or home décor from ordinary to extraordinary by embellishing with trimmings. 3:30 p.m.: Kitchen Stage: Make & Take the Grain Sack Pumpkin from the October cover of Country Living magazine with Food and Crafts Director Charlyne Mattox. $25 in advance. 4:00 p.m.: Main Stage: Denise Sabia, blogger for The Painted Home will be demo setting a harvest table with farmhouse flair. 11:00 a.m.: Main Stage: Amie and Jolie Sikes, The Junk Gypsies to talk about their big dreams, roadside treasures, and down-home design aesthetic followed by a book signing. Books are available in advance online at stellashows.com and will also be available for purchase on-site. 12:00 p.m.: Main Stage: Jana Platina Phipps, The Trim Queen, will share tricks to turn items in your wardrobe or home décor from ordinary to extraordinary by embellishing with trimmings. 1:00 p.m.: Main Stage: Joanne Palmisano, award-winning interior designer & regular DIY Network contributor will share 20 Incredibly Easy DIYs for design and gift ideas. 2:00 p.m.: Kitchen Stage: Charlyne Mattox, Country Living Food and Crafts Director will be doing a cooking demo on easy dinner for real life, followed by a signing of her book Cooking with Seeds. Books will be available for purchase on-site. 4:00 p.m.: Kitchen Stage: Melissa Caughey of Tilly’s Nest, HGTV.com & CountryLiving.com writer and contributor, will demo tablescaping with succulent-topped pumpkins. 12:00 p.m.: Kitchen Stage: Joanne Palmisano, award-winning interior designer & regular DIY Network contributor will lead a workshop on how to make your very own vintage-inspired sign. 1:00 p.m.: Main Stage: Cari Cucksey, star of HGTV’s Cash & Cari will present ways to paint, stain, and spray your way to upcycling old items. 2:00 p.m.: Kitchen Stage: Melissa Caughey of Tilly’s Nest, HGTV.com & CountryLiving.com writer and contributor, will share how to start your own backyard chicken coup, followed by a signing of her book A Kid’s Guide to Keeping Chickens. Books will be available for purchase on-site. The Fair is held rain or shine and regular parking fees apply. 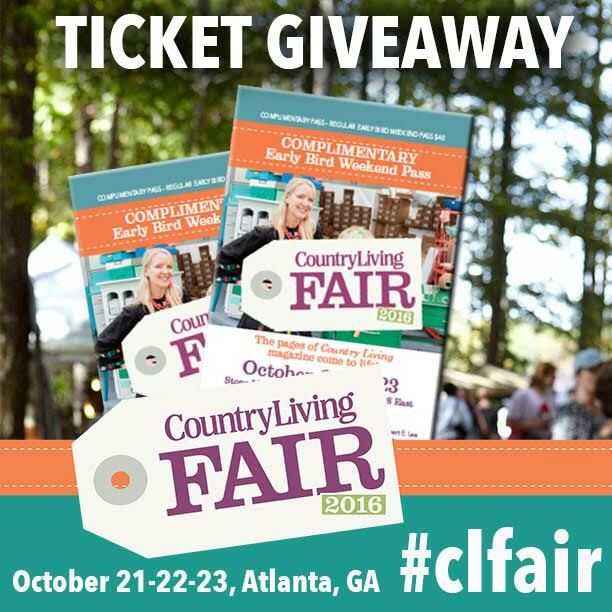 Download the new Country Living Fair App from the App Store or Google Play to have all the most current information about featured talent, vendors and locations at your fingertips within a really easy-to-use mobile application. Love to Craft? Love to Cruise? Learn more about the 2017 Country Living Coast-to-Coast Cruise when speaking with CL Editors at the Fair. Special guests (and Fair favorites) the Junk Gypsies will be aboard, sharing their addiction to flea marketing and Americana-inspired design through demonstrations, DIY projects and Q&A sessions. There will also be a special “Junk Gypsy Prom”—a chance to dance the night away on the high seas in “junk fashion.” For more details visit countrylivingcruise.com.